The story of Prometheus, the creator and benefactor of mankind, has always fascinated us, especially how he stole fire for us from the Olympian Gods. So too, the story of Pandora, with her Jar of Hope. The stories of the cosmic gods have shaped our culture, our literature, our art and even our religion. They are a portion of our heritage from the distant past, and they form perhaps as important a part of our intellectual life as they did of that of the people among whom they originated. This is the second of a series of Old Greek Stories by James Baldwin, which will be added to in weeks ahead. The name of the elder of these brothers was Prometheus, or Forethought; for he was always thinking of the future and making things ready for what might happen tomorrow, or next week, or next year, or it may be in a hundred years to come. The younger was called Epimetheus, or Afterthought; for he was always so busy thinking of yesterday, or last year, or a hundred years ago, that he had no care at all for what might come to pass after a while. For some cause Jupiter had not sent these brothers to prison with the rest of the Titans. Then he went boldly to Jupiter and begged him to give fire to men, so that they might have a little comfort through the long, dreary months of winter. Prometheus made no answer; but he had set his heart on helping mankind, and he did not give up. He turned away, and left Jupiter and his mighty company forever. As he was walking by the shore of the sea he found a reed, or, as some say, a tall stalk of fennel, growing; and when he had broken it off he saw that its hollow center was filled with a dry, soft pith which would burn slowly and keep on fire a long time. He took the long stalk in his hands, and started with it towards the dwelling of the sun in the far east. “Mankind shall have fire in spite of the tyrant who sits on the mountain top,” he said. Things might have gone on very happily indeed, and the Golden Age might really have come again, had it not been for Jupiter. But one day, when he chanced to look down upon the earth, he saw the fires burning, and the people living in houses, and the flocks feeding on the hills, and the grain ripening in the fields, and this made him very angry. “Who has done all this?” he asked. Of course it would be easy enough to deal with Prometheus at any time, and so Jupiter was in no great haste about it. He made up his mind to distress mankind first; and he thought of a plan for doing it in a very strange, roundabout way. In the first place, he ordered his blacksmith Vulcan, whose forge was in the crater of a burning mountain, to take a lump of clay which he gave him, and mold it into the form of a woman. Vulcan did as he was bidden; and when he had finished the image, he carried it up to Jupiter, who was sitting among the clouds with all the Mighty Folk around him. It was nothing but a mere lifeless body, but the great blacksmith had given it a form more perfect than that of any statue that has ever been made. “Come now!” said Jupiter, “let us all give some goodly gift to this woman;” and he began by giving her life. Then the others came in their turn, each with a gift for the marvelous creature. One gave her beauty; and another a pleasant voice; and another good manners; and another a kind heart; and another skill in many arts; and, lastly, some one gave her curiosity. Then they called her Pandora, which means the all-gifted, because she had received gifts from them all. Prometheus had often warned his brother to beware of any gift that Jupiter might send, for he knew that the mighty tyrant could not be trusted; but when Epimetheus saw Pandora, how lovely and wise she was, he forgot all warnings, and took her home to live with him and be his wife. Pandora was very happy in her new home; and even Prometheus, when he saw her, was pleased with her loveliness. She had brought with her a golden casket, which Jupiter had given her at parting, and which he had told her held many precious things; but wise Athena, the queen of the air, had warned her never, never to open it, nor look at the things inside. “They must be jewels,” she said to herself; and then she thought of how they would add to her beauty if only she could wear them. “Why did Jupiter give them to me if I should never use them, nor so much as look at them?” she asked. 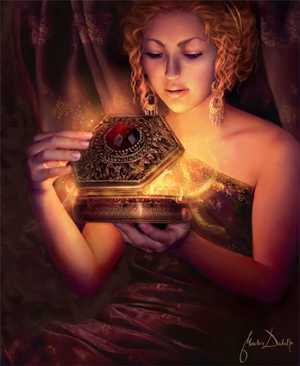 The more she thought about the golden casket, the more curious she was to see what was in it; and every day she took it down from its shelf and felt of the lid, and tried to peer inside of it without opening it. She opened the lid a very little, just to peep inside. All at once there was a whirring, rustling sound, and before she could shut it down again, out flew ten thousand strange creatures with death-like faces and gaunt and dreadful forms, such as nobody in all the world had ever seen. They fluttered for a little while about the room, and then flew away to find dwelling-places wherever there were homes of men. They were diseases and cares; for up to that time mankind had not had any kind of sickness, nor felt any troubles of mind, nor worried about what the morrow might bring forth. These creatures flew into every house, and, without any one seeing them, nestled down in the bosoms of men and women and children, and put an end to all their joy; and ever since that day they have been flitting and creeping, unseen and unheard, over all the land, bringing pain and sorrow and death into every household. If Pandora had not shut down the lid so quickly, things would have gone much worse. But she closed it just in time to keep the last of the evil creatures from getting out. The name of this creature was Foreboding, and although he was almost half out of the casket, Pandora pushed him back and shut the lid so tight that he could never escape. If he had gone out into the world, men would have known from childhood just what troubles were going to come to them every day of their lives, and they would never have had any joy or hope so long as they lived. And this was the way in which Jupiter sought to make mankind more miserable than they had been before Prometheus had befriended them. 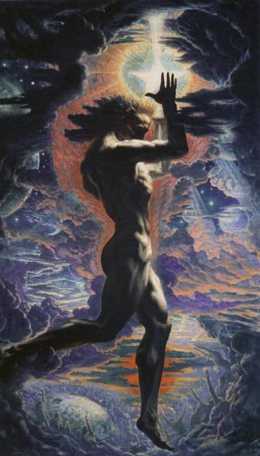 The next thing that Jupiter did was to punish Prometheus for stealing fire from the sun. He bade two of his servants, whose names were Strength and Force, to seize the bold Titan and carry him to the topmost peak of the Caucasus Mountains. Then he sent the blacksmith Vulcan to bind him with iron chains and fetter him to the rocks so that he could not move hand or foot. Vulcan did not like to do this, for he was a friend of Prometheus, and yet he did not dare to disobey. And so the great friend of men, who had given them fire and lifted them out of their wretchedness and shown them how to live, was chained to the mountain peak; and there he hung, with the storm-winds whistling always around him, and the pitiless hail beating in his face, and fierce eagles shrieking in his ears and tearing his body with their cruel claws. Yet he bore all his sufferings without a groan, and never would he beg for mercy or say that he was sorry for what he had done. 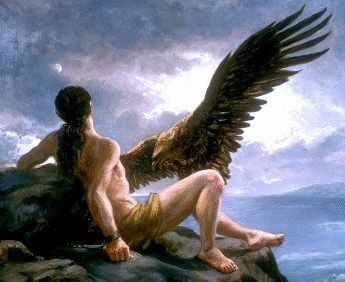 Year after year, and age after age, Prometheus hung there. Now and then old Helios, the driver of the sun car, would look down upon him and smile; now and then flocks of birds would bring him messages from far-off lands; once the ocean nymphs came and sang wonderful songs in his hearing; and oftentimes men looked up to him with pitying eyes, and cried out against the tyrant who had placed him there. Poor Io would have spoken, but she could not. Her sorrowful eyes looked once more at the suffering hero on the peak, and then she turned and began her long and tiresome journey to the land of the Nile. Ages passed, and at last a great hero whose name was Hercules came to the land of the Caucasus. In spite of Jupiter’s dread thunderbolts and fearful storms of snow and sleet, he climbed the rugged mountain peak; he slew the fierce eagles that had so long tormented the helpless prisoner on those craggy heights; and with a mighty blow, he broke the fetters of Prometheus and set the grand old hero free. Now check out The Story of the Flood.